Confronted with galactic nations thirsting for power, valiant men and women have decided to rise above the solar waves our write their own destiny. Danger is a fair price for a life if freedom and adventure. They are the legendary space pirates! All hands on deck! Work together or go at it alone as you pillage vessels brimming with gold, discover exotic planets and wage war on your rivals. This is the stuff legends are made of and yours will be written in laser fire! 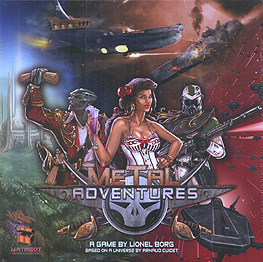 Metal Adventures is a game for 3 to 6 Space Pirates. The dynamic action expertly mixes combat, bluffing and betrayal. Winning and completing your secret objectives will require you to master the skills of diplomacy and deception. The Pirate's Code is honour binding, but true Pirates can always find a loophole.